Currywurst is popular German fast food that contains steamed pork sausage that’s been fried and cut into slices The slices are covered with curry ketchup and topped off with a sprinkling of curry powder. Currywurst is sometimes served with a bread bun, but it can also be accompanied by chips. Although things will have been done differently when the dish was created, nearly 70 years ago, these days the sausage (wurst) is sliced using a special sausage slicing machine that appears to have been developed specially for people selling this snack. The sausage is dropped in, vertically, through an aperture at the top of the machine and emerges from the other end in slices that fall straight onto the disposable plate the wurst vendor has placed there to catch your food. The first time I tried German currywurst was during a visit to the Dutch city of Rotterdam. I was there for the summer carnival and walked past a snack bar that appeared to specialize in selling German food. I looked at the menu, the currywurst appealed to me more than the other options, and the choice was made. From what I remember I enjoyed it a lot, but it was several months ago. 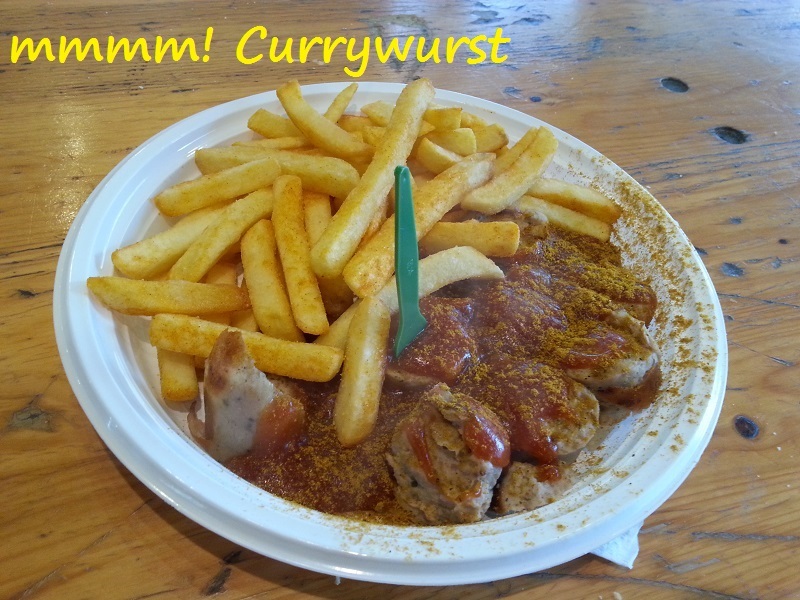 The second time I tried currywurst was during a recent visit to Düsseldorf and I had two portions. I ate the first one during a night out in Altstadt and the second one the following afternoon and because the visit was only a few days ago, I have no problem remembering. I enjoyed it and am definitely a Currywurst fan and, after having tried one portion with chips, and another with a bread bun, my own personal preference is to eat it with chips. Being a man who has a lot of cultural curiosity, I decided to research the history of currywurst and was quite surprised to learn it may never have existed had there not been British soldiers stationed in Berlin after the Second World War. Currywurst was allegedly created on September 4th 1949 in the Charlottenburg district of Berlin, by a German woman named Herta Heuwer. She owned a snack bar at the junction of Kantstraße and Kaiser-Friedrich-Straße and, at that time, the allied forces occupying Berlin were bringing lots of new eating habits into the city. The Americans loved their tomato ketchup and the Brits had a thing for curry. After some successful bartering with British troops, Frau Heuwer found herself in possession of some curry powder and ketchup and decided to mix things up a bit and then try combining her concoction with German sausage. If the story is true, its fair to say the dish has caught on in a very big way. Over 850 million currywursts are consumed each year in Germany and 70 million of them are eaten in Berlin. That’s a lot of wurst! How the German Pfand System Works: Stop Throwing Money Away!